2000 Elektra Entertainment Group Inc. Marketed by Rhino Entertainment, a Warner Music Group Company. 1985 Elektra Records. Marketed by Warner Strategic Marketing, a Warner Music Group Company. 1972 Asylum Records. Marketed by Warner Stategic Marketing, a Warner Music Group Company. 1979 Asylum Records. Marketed by Warner Strategic Marketing, a Warner Music Group Company. 2003 Elektra Records. Marketed by Warner Strategic Marketing, a Warner Music Group Company. 1976 Elektra Records. Marketed by Warner Stategic Marketing, a Warner Music Group Company. 1975 Asylum Records. Marketed by Warner Strategic Marketing, a Warner Music Group Company. 1974 Asylum Records. Marketed by Warner Strategic Marketing, a Warner Music Group Company. 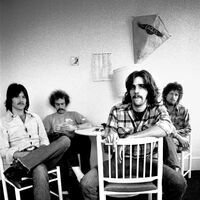 2007 Eagles Recording Co. II under exclusive license to Warner Music Group. All Rights Reserved. Marketed by Warner Music Group. 1976 Elektra Records. Marketed by Warner Strategic Marketing, a Warner Music Group Company.